Saice | Spicy Beef is a Bolivian food cooked with aji which is similar to hot pepper. Fry the onion and garlic until tender but not brown. Add the parsley, tomato, aji and condiments. 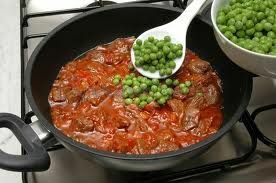 Cook until the fat separates from the paste, then add the peas and water. In a separate frying pan brown the meat in the rest of the oil. Add to the aji mixture and cook until almost all the water has evaporated. Serve boiled potatoes and salad.